Hello friends! I hope that this weekend is treating you well! :) We are about ready to go to my In-laws' house to celebrate the kids birthday with our families. It's just a little lunch but I'm sure it will be lots of fun. 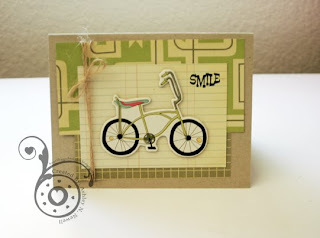 Today, I'm sharing a card I made for the Limelight Papercrafts sketch and product challenge. I combined this with the Moxie Fab Bicycle challenge. I tried to make a semi-masculine card, did it work? The paper and chipboard are Cosmo Cricket's Boyfriend line. The string is from May Arts, bought at Limelight. And the stamp is Unity Stamp Co and Samantha Walker's Retro Roadsigns. Easy peasy! Hope that you all have a wonderful Sunday! Hugs and KEEP COOL! It's gonna be 99 degrees here today! Oh that is so cute! I love the colors too. This is a great manly man card. I just love your take on the challenges. Have fun at the lunch party. Love this! Very masculine! Way to rock the challenges! 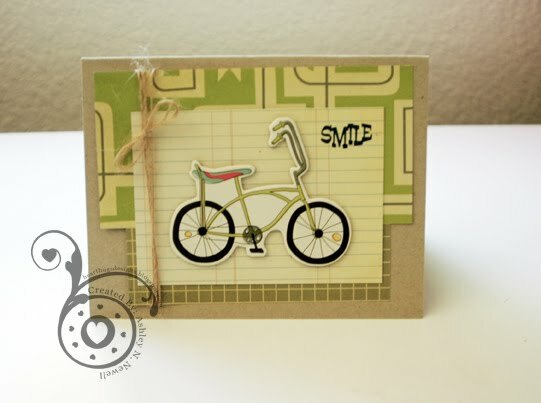 That back ground paper is perfect for the bicycle challenge! Awesome! LOVE your bike card, Ashley! The colors and elements are perfect!